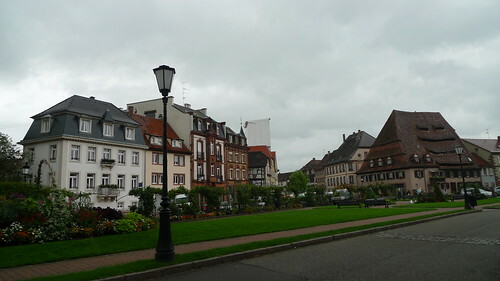 A few more notes on Wissembourg before we head back to Paris. I’ve been lucky to travel a good deal in the last few years, and this trip was certainly among the best. Growing up in Hawai’i we usually traveled in the direction of Asia, exploring Bangkok, Tokyo, China, and my parent’s hometown of Vietnam (we’re of Chinese descent but have three generations in Vietnam). Luckily my parents and sister love traveling just as much, if not more. Now that I live in NYC, I’m making it a priority to explore more of Europe. We have Italy and Greece on our list for next year. Fingers crossed we can make it happen. But there is always Hawai’i, and no matter where I go, you can always count on me visiting Hawai’i at least twice a year. …and fresh eggs from his grandma’s farm. We visited the farm last year remember? We indulged a bit too much on the first few days in Wissembourg. Excellent wines, cheese at every meal, foie gras, and of course that tarte flambée I can’t get out of my mind. It was that good. So on out last day, lighter food was in order, and Pierre’s mom whipped up a clean stir fry with plenty of ginger and all the vegetables from the garden. …always paired with salad. Collards greens (also from the garden!) sautéed with thin sliced onions and raisins. One morning we woke to a fresh Kugelhopf, almond-studded on top and with an abundance of plump golden raisins. I wish I could send you the yeasty, sweet and nutty scent of warm kugelhopf over the computer! Here it was rising the night before. And then, breakfast. Always with a pot of Jasmine tea. Espresso for Pierre. P.S. One afternoon while walking to town, we found this little goat. The poor thing was lost, no more than a month old. He was frightened by passing cars but affectionate and trusting with humans. He even walked up to a girl in a cafe and tried to lick her ice cream cone! A lady eventually picked up (just like that, with both arms) and put him in the front seat of the car. She drove little goat to the police station, and he sat in the car seat, quiet and calm as if he belonged there! A quiet ten-minute stroll from home takes us to the center of Wissembourg, a tiny and picturesque town with more pâtissières than one could imagine. Though the prices may be lower, there is no sacrifice in quality and atmosphere. Inside, high ceilings and glass cases filled with chocolates and wicked delicious bonbons to the right. And on the left, a rainbow of sweets and cakes with éclairs presented front and center, and savory pastries further into the store. It’s a tea salon as well, with both indoor and outdoor seating. A perfect way to devour a slow summer afternoon. ….éclair, which comes in coffee, vanilla, and chocolate. Coffee is my favorite of the trio and it is sinfully indulgent, the buttery coffee crème pâtissière heady and intense as an espresso, just piped tight into the choux pastry shell. So fresh. At the very center of the appropriately named Royal, is crunchy and nutty sweet feuillantine praliné cocooned by a buttery chocolate mousse. Almond macaron serves as the base. Creamy, crunchy and crisp – a little of all textures bound by dark chocolate. We ate so many Mille-Feuilles on this holiday that I can barely keep track of them all. Pierre loves them because they are the “most buttery and least sweet” of desserts, and I’d have to agree. The strawberry version from Pâtissière Rebert features a strawberry-soaked génoise tucked between vanilla bean custard and sweet berries on top. Fresh is key when it comes to mille-feuilles lest you risk the chance of soggy puff pastry. And for an afternoon stroll (on the single warm day of our visit ;) what could be better than a just-dipped ice cream bar of vanilla ice cream with chocolate and crushed almonds on the outside? They also do a beautiful strawberry ice cream dipped in pistachio glaze, but the classic pairing of vanilla + chocolate just seemed to good to pass up. Hope everyone is having a good start to the week! Pierre’s mom was out in the garden. She came in with a crate full of just-picked mirabelle plums. Tiny and golden. The last ripe batch of the summer season. …the sort where each spoonful is the perfect balance between smooth and chunky with the stewed fruit. Just mirabelles, sugar and lemon juice. Simplicity is best. We ate it straight out of the jar, and spread on baguettes with butter for breakfast. And for dessert, we found them tucked into a homemade tart shell, right above a creamy, almond-rich brush of frangipane. Another glass of wine, followed by a fresh mint tisane and lush evening of jazz on the stereo. Ahh, vacation. I love a good story and because of that, often have a tendency to embellish. So you’ll have to smile and forgive me when I tell you that this Tarte Flambée, a regional specialty of Alsace is insane, incredible, and reason enough alone to travel to the northeast of Alsace. In the town of Hoffen – about a 20-minute drive from Wissembourg (where we are staying with Pierre’s parents), Au Soleil is legendary among locals for Tarte Flambée. In NYC, tarte flambée from The Modern is great. Or so I thought. The one we had last night put everything in a different perspective. Tarte Flambée is made for group eating. Order each tarte one at a time, and it’s served in precisely 10-minutes. Slice into eighths and devour. Sometimes they give you plates, sometimes they don’t. Either way, this is one dish that even the French eat with both hands. Baked in a wood-fired oven, the cracker-like crust is smothered with fromage blanc, sliced onions and an even distribution of salty, meaty lardons. The spread of fromage blanc looks thin upon first sight, but then you realize that the edges of the crust are slightly raised and the center is pushed in, making for a quarter-inch thick spread of the cheese. It is heaven and the more you eat, the more you’ll crave. …a sweet version of Tarte Flambée! Here we opted for a half-half of apples and bananas. It’s served in the same style as the savory tarte, only here the surface of the fromage blanc is dusted in white sugar. A glass each of rum (for the bananas) and calvados (for the apples) is poured over the surface and lighted. WOOOOSH!! Flambée!! Slice and devour, no talking. One more round, another glass of beer, muscat to finish.